My Dad and I often have long conversations about solving the world's problems. They can go pretty deep sometimes. I cherish these kinds of conversations with him. He is a wise man, and I am grateful to learn from him. He also taught me to ski when I was five years old. He taught me to ski powder when I was nine years old at Vail. He gave me the keys to the rig that has drove me to where I am today. 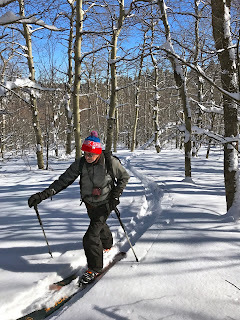 I was able to return the favor a little with getting him into the backcountry and learning to tour in and around avalanche terrain. 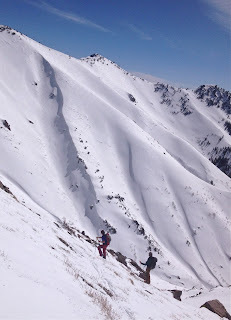 We typically stay on small slopes and short approaches, because it makes for a more enjoyable day as my Dad began touring when he was sixty years old. He says that he wishes he had found touring twenty-five years ago, and I just laugh and say that he was still too busy teaching me to ski in Wisconsin to have the time to get access and learn. He and my mom were married young and had kids pretty young too by today's standards. My dad never got to move out west and charge like many of his friends did. I am glad he can still take advantage of it now. "Better late then never" is what we always end up with when that topic comes up on the skin track. My dad came into town along with a big storm, and we got a chance to do some charging. ^The moose at Snowbasin shows the morning's gifts. ^Half-lit daylight adds some soul to the day. This kind of in and out half light casts long shadows and warm light all over Snowbasin and has a way to adding nostalgia to the day. Makes for cool pictures too. ^Of course, its Snowbasin, the backyard resort for over 16 years now. I know how to find the fresh stuff there. My dad still knows how to shred it apart! My dad is still a devout telemark skier, but I have transitioned him into a quiver that allows him the ability to alpine ski when he wants to. Mid-sixties at this point, and obviously father time is trying to go to work on my dad. However, he loves the telemark turn. Over the last few years I noticed that he was using a lot of p-turns on his telemark gear when he came to visit me and when we were touring in the backcountry. I began contemplating a quiver system for him that was only even available for a very short window in manufacturing. The Scarpa TX-Pro has tech toe inserts in the toe for the newest telemark tech toe bindings beginning to come to market. However, for a few years they also had the alpine tech heel insert as well, and manufactured some "bellow pucks"for underneath the telemark bellow when in an alpine tech binding so that the bellows don't flex during the alpine turns. I jumped on the technology, and began building upon my dad's telemark ski quiver with some alpine skis. I felt like it should feel sacrilegious to do this, but I really don't. It took me a couple years to get the whole set-up together for him, but now he can ski tour on a super lightweight Voile Charger BC and a low-tech alpine binding. Also, he can ski a beefier Fisher Watua ski and a Fisher AT binding with a 14 DIN capacity in the resort out west. 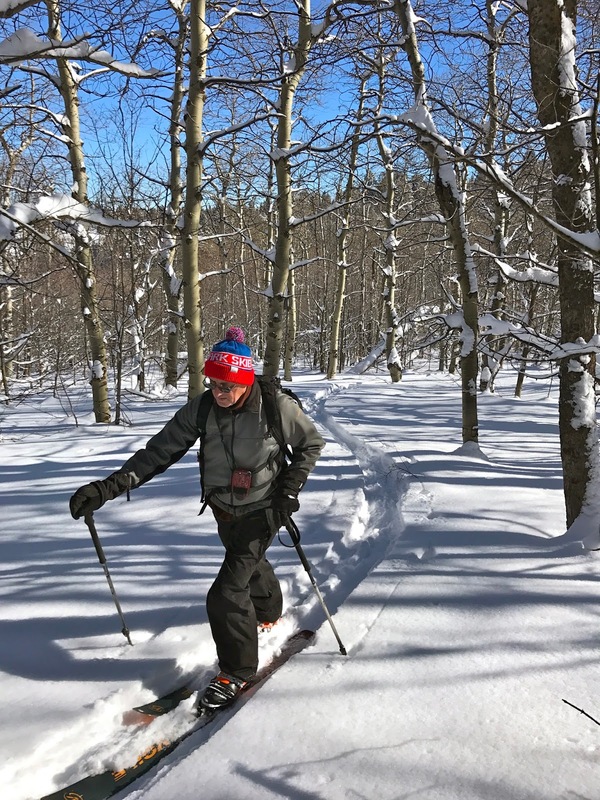 The difference is that he can do it with his new Scarpa TX Pro NTN telemark boots, and he can still telemark at home in the midwest all he wants as we convert his midwest skis over to NTN now. This trip when he came out we finally got to test out all the new skis. It took him a while to get used to the fixed heel, and it definitely has its downfalls, but the stability in making p-turns was so good that my mid-sixties father could ski hard the way he wanted to without really taxing his legs because alpine skiing really is indeed much easier to do. There is no denying that. However, in this system, my dad can still freeheel ski his heart out in his midwest home resorts and touring, and actually it keeps him stronger then if he just totally converted to alpine. Then he can alpine ski the bigger mountains out west, and also be able to do some touring with me out here too. All the while skiing the way he'd like to, and on the slopes he'd like to. All with one boot. Scarpa has since decided to remove the heel piece due to liabilities, but we are stoked because we got on top of it when it was available. Now he is set-up for the duration, and it will actually help keep freeheel, and skiing in general, alive and well for him for many years to come. There is nothing sacrilegious about that in my book. ^Touring well into senior citizen status. Kind of a big deal. To us at least. ^Awesome smooth turns even after a two-hour approach! My philosophy as a "freeheel" skier has always been that I believe in using which ever turn I deem is right for the moment. Often times, parallel turns are the turns I choose in certain situations. I am not a "telemark or die" kind of telemark skier. Some are, and I respect that. For me though, the freedom to make any turn I wish is the whole point I choose this freeheel life. I make them high stance, low stance, weight forward, weight back, hand dragging, and on and on. That is my favorite part of freeheel. The freedom. So I don't feel bad about this transition with my dad at all, and I don't think he should either. 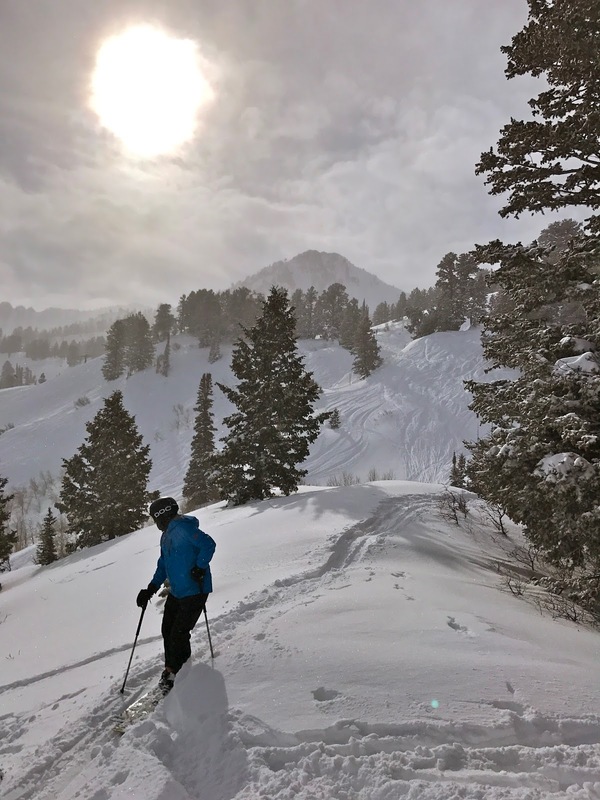 Due to this slight transition in his ski quiver now he and I can keep going really deep into figuring out all the world's problems on skin tracks and chairlifts in the west, midwest, and anywhere else sharing smooth deep powder turns like these together for a long time to come. That kind of freedom and authenticity is just about as "freeheel" as it gets to my understanding of the "freeheel life".